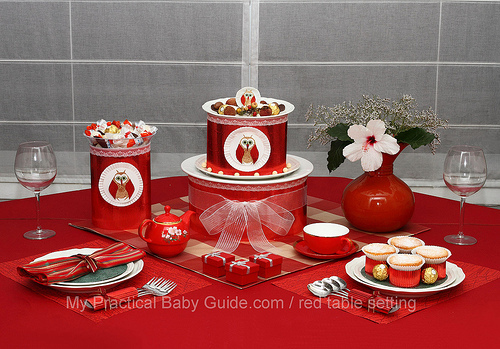 How to Through an Owl Baby Shower? 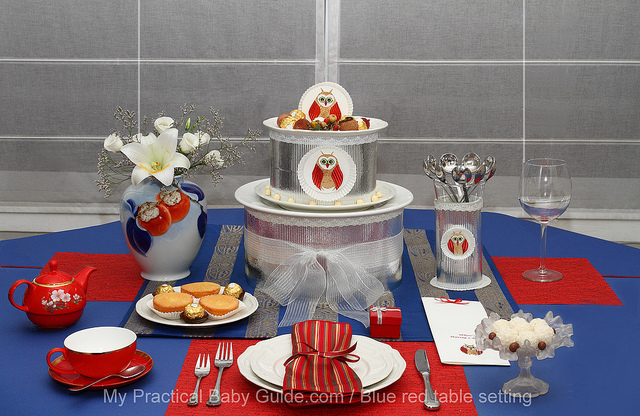 An owl baby shower is one of the most popular baby shower themes. Maybe it's their big eyes, their gentle nature, their soothing hoo, or maybe it's that moms-to-be are thinking ahead to when they'll be up all night. 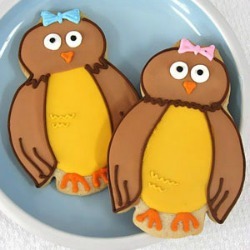 I searched the web for you and found a lot of creative ideas so you can plan the perfect owl baby shower. Here you will find a lot of ready made themed items such as decorations, invitations, favors and free printables that can save you a lot of time and, of course, money. Invitations decorated with cute owls are suitable for both baby boys and baby girls. You can buy fully personalized baby shower invitations or, themed invitations that you can hand write in all of the shower details. You can always be original and make your own. Your choice will most likely be dictated by your budget. Whoo, whoo…is coming soon? Baby ______ that is whoo! Guess whooo is almost due?…______ that is whoo! Whoo, whoo…is coming soon? Boy or Girl…we don’t know whoo! What a hoot! Baby ______ is arriving soon! You…hoooo! _______ is having a baby! Start by choosing the color scheme and color combination. 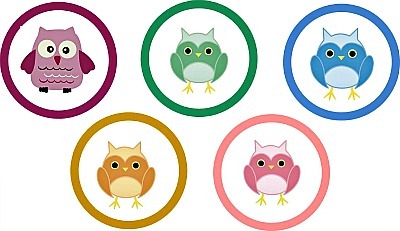 For owl baby shower theme any harmonious color combination will be suitable, use the colors that you like and of course you can always use the traditional pink for a girl or blue for a boy. Decorate a small table at the entrance and ask your guests to leave a wise advice for mom to be and put it in a jar. You can use this free printable owl baby shower advice for mom. Get a branch from your yard, hang it on the wall and place a toy owl or a cardboard owl on the branch. Add green and blue pom poms to make it look like a tree. Tableware of solid color will easily complement most of the party decorations. Choose green, brown or white, or any other color that you like. If you prefer a themed tableware that matches your concept, choose decorations that are harmonious with it. Download our free owl baby shower printables and use them to decorate your cupcakes, foods and drinking bottles. Click on the picture of your choice and download the free PDF files. These beautifully custom designed cookies are perfect for baby showers. They can be used as favors, prizes and desert decoration. Made from a classic butter cookie recipe with a touch of almond, guests of all ages will love these cute and delectable treats.Each cookie comes in a generous size, approximately 4" x 4", and is hand decorated with royal icing that dries into a sweet crunchy topping. Cookies are chewy on the inside. The shelf life of is 3 weeks. 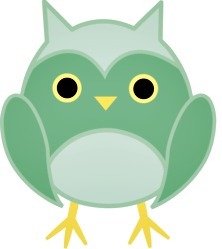 This owl candle favor makes a great decorative accent to your baby shower theme. The candle comes in its own presentation box, ready to give to guests with no additional packaging or decorating needed. 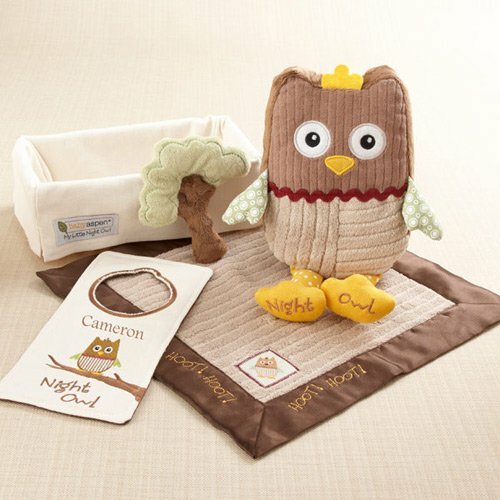 Be wise and give mom to be this adorable gift set.This gift set features a cuddly owl rattle, a baby blanket, a crinkle toy, and nursery door hanger. 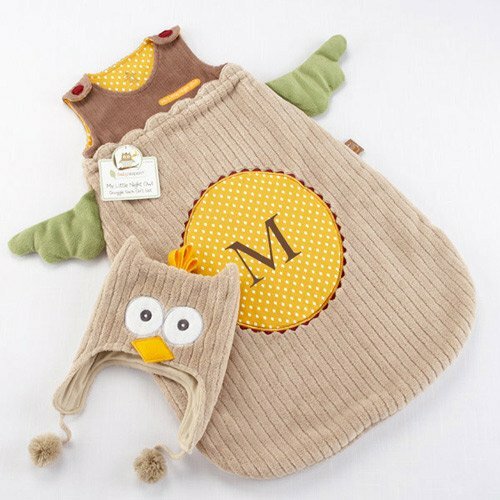 Whooo will be able to resist this personalized owl snuggle sack and cap? Cozy owl snuggle sack and cap are made from a soft plush outside and super-soft 100% cotton inside to keep your little one snug. Click on the pictures below to download our free baby shower bingo cards.